Empire Products specializes in design, engineering, and cost effective manufacturing and contract military sewing. 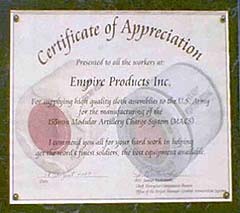 EPI has received recognition for quality manufacturing of the 155 mm MACS program from the U.S. Army and General Dynamics. We are recipients of the highest Government awards for Quality Control with a history of on time deliveries.